I am the Hermetic King resurrected from the sepulcher of the Nigredo. My fire has been drawn out of the darkness; purified and exalted. My expansive fire is Solar by nature and I am called the Son of the Sun. I am the purified and exalted fire of your soul. I am the solar radiance of your consciousness and the true Gold of the philosophers. Blessed are they who have assimilated the innermost nature of this most adorable Fire! Dorn said "Become a Living Philosopher's Stone". we transmute the world and whatever we project the Stone upon. For our stone is "Our Fire". Once one extracts the Philosopher's Stone one eventually becomes "A Stone of the Philosophers". Inner fire is a God-given gift and can persist in male and female lines indefinitely. by KINdling, Sympathetic Resonance & Entanglement. KINdling causes permanent changes in dragon kin neural circuitry. to change and realign themselves in response to repeated exposure to stimuli. "KINdling" is a possible mechanism for 'soul retrieval' in the dragon lines and an alternative mechanism for the mutual stimulation of gene expression in psychosocial genomics. Soul Retrieval is part of our Journey to Wholeness and quest for self-knowledge. It refers to shamanic practices that reintegrate various interpretations of the soul that might have become disconnected, trapped or lost through trauma -- loss of vitality and connection to life. KINdling is renewal of life force. Soul Retrieval opens the door to self realization as Soul. From a shamanic point of view, part of the soul may split off, or dissociate, when we experience trauma or abuse. Soul loss is a spiritual illness that causes emotional and physical disease. We need to be re-tuned, recalibrated from the deepest level of our being - from the Source Field where our patterns remain intact, undisturbed and self-organizing. The lost soul has been found, retrieved, and revitalized. Many report that even nonlocal contact with dragon kin spontaneously reawakens a new energy or level of vitality in themselves. Such spontaneous phenomena can be called "KINdling." We need to 're-vision' soul retrieval by viewing it not only as a reintegration of the personality, but also as an affirmation of polytheistic soul that is at the heart of the "I-Thou" of human and Cosmic life. If soul is both one and many, then the centripetal re-connection to multiple soul compensates the centrifugal re-collection of an original unity of soul. Just as shamans, through initiation death-rebirth must heal themselves, so we transcend the "dis-ease" of imbalance and conflict by becoming consciously centred in the Self rather than in the one-sided ego. This action frees up our genetic predisposition for transcendence. Shamans describe the soul as the essential self that is unique and can't be replaced by anyone else's soul nor by spiritual energy. But dragons do have a latent capacity to kindle spontaneous healing and genetic memory in one another. Shamanic practitioners journey to retrieve lost soul parts, bringing back their essence. Shamans look at the spiritual form of illness which might manifest on an emotional or physical level, preventing remembrance of one's essential nature. Healing is a form of creativity. Whether in a positive or negative drection, kindling is a relatively permanent state of heightened susceptibility (Gilbert, 1994). Kindling effects result from neuroplasticity, the ability of groupings of neurons to change and realign themselves in response to repeated exposure to stimuli. Kundalini has elements similar to the kindling phenomena, and yet runs through a very complicated sequence of "events." The article: "Kindling, once epilepsy model, may relate to kundalini," Brain/ Mind Bulletin, Vol. 2, No.7, February 21, 1977; pp. 1-2.) reports on the convulsion-like phenomenon called kundalini. At the Max Planck Institute in Germany, subjects reported "electrical sensations, tingling, inner lights, even convulsions usually followed over a period of time by a moderation of 'symptoms' and apparent alterations in the central nervous system." This article says that the kundalini phenomena typically occurs after a period of meditation in a setting that is non-threatening. This report suggests that while meditating, the individual tries to arrest all thought or cortical activity, thus allowing the evolutionary more primitive areas of the brain to assert itself. The Kindling Model is one of the current interpretations of PTSD. 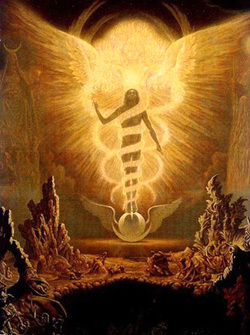 The scientists concluded that those who experienced the kundalini phenomenon were actually reexperiencing primal pain laid down before the brain has completely developed (Toxic Mind Theory).